In a career spanning over thirty years Simon’s climbing and travelling has taken him from Alaska in the west to Australia in the east and from Greenland to the Antarctic. 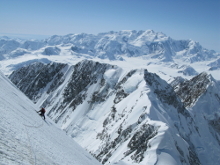 Highlights include: The first ascent of the West face of Siula Grande (6356m) in the Peruvian Andes in 1985, the first ascent of the S.W.Face of Hispar Sar (6400m) Pakistan in 2004, to the first ascents in The Stauning Alps, Greenland in 2016. 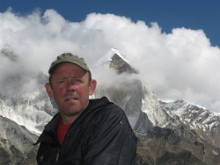 Simon has written three books; Against the Wall, The Flame of Adventure and The Wild Within, which have all been shortlisted for mountain literature prizes. He is a popular public speaker, regularly touring theatres in the UK and worldwide. Internationally acclaimed mountaineer, Simon is one of Britain’s most prolific and accomplished exploratory mountaineers, best known for his role in Joe Simpson’s book and the subsequent film, Touching the Void. It was an experience that could put many off the sport of mountaineering – but not Simon. Over 30 years later he is still an active exploratory climber and guide, making several expeditions to the mountains each year. From the Arctic to the Antarctic, Alaska to Central Asia there is hardly a significant range he has not visited. Come along and witness Simon’s tireless journey from that mountain in Peru to some of the remotest on the planet and share with him the drama, excitement and beauty of modern, lightweight Alpinism. Told with wit, dry humour and lavishly illustrated with images and video collected on his great climbs. Hi, thought this Lecture may be of interest http://www.wildernesslectures.com/speaker.php?id=243 ----------------------------- Internationally acclaimed mountaineer, Simon is one of Britain’s most prolific and accomplished exploratory mountaineers, best known for his role in Joe Simpson’s book and the subsequent film, Touching the Void. It was an experience that could put many off the sport of mountaineering – but not Simon. Over 30 years later he is still an active exploratory climber and guide, making several expeditions to the mountains each year. From the Arctic to the Antarctic, Alaska to Central Asia there is hardly a significant range he has not visited. Come along and witness Simon’s tireless journey from that mountain in Peru to some of the remotest on the planet and share with him the drama, excitement and beauty of modern, lightweight Alpinism. Told with wit, dry humour and lavishly illustrated with images and video collected on his great climbs.